Did you ever think about the four creatures in Ezekiel? 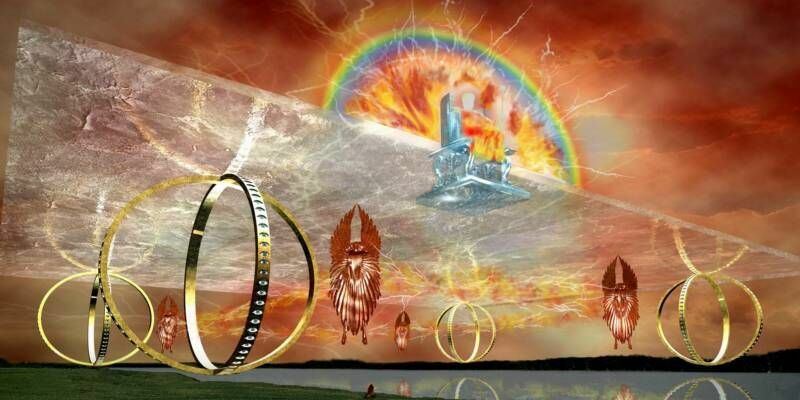 Did you know that they are also found in Revelation? You did? Good. However, did you also know that you can see this same picture in Numbers? No? Well read on. In Revelation 4:7 we also see four living creatures, but each has its own face. However, we still see the face of a lion, an ox, a human, and an eagle. 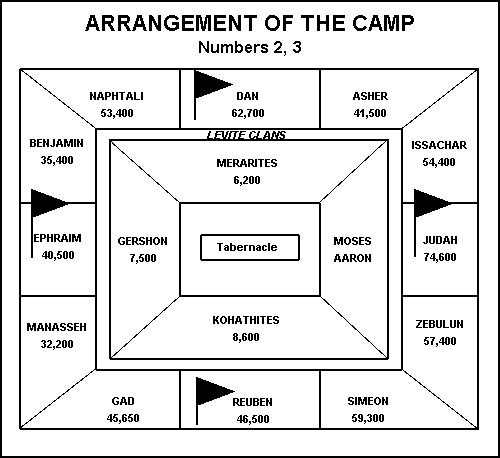 Keep this in mind as we look at how God set up the camp in the wilderness, described in Numbers chapter 2. In verse 3 we see that on the east side, under the banner of Judah, are the tribes of Judah, Issachar, and Zebulun. In verse 10 we see that on the south side, under the banner of Reuben, are the tribes of Reuben, Simeon and Gad. The last thing we need to see before pulling all this together is that God was in the middle of the camp. His presence was in the tabernacle dwelling with His people! So here we have God in the middle of the camp, surrounded by the tribe of Levi. And just beyond the Levites, we see the banners of Judah (the lion), Reuben (the man), Ephraim (the ox), and Dan (the eagle). Each of these faces correlates to the same position of the faces found in Ezekiel. Wherever the Spirit moves, we should move. Wherever the Spirit stops, we should stop. Thanks Ro for the picture of Ezekiel’s vision and the lesson. It was enlightening and the pic is the best I have seen. Where did you get it? Thanks, Deb! Not sure where the picture originated. I Googled for an image, and this showed up in several sites. I enjoyed your post and your pictures are outstanding. I am currently writing a book about the four beasts. The four beasts of Ezekiel actually only have one face each. I know it reads a bit confusing, but he is in vision, and he is telling us that the chariot consists of two beasts to the right and two on the left and he tells us what their faces look like based on their position. They are the exact same beasts of Revelation, there is no difference. Are you an artist please respond. Hi Abner, thanks for stopping by! While a few of my adult children are artists, as was my father, that gift skipped right over me and landed on my kids. Interesting perspective regarding the four beasts having only one face each. In the Hebrew, the adjective for ‘every one’ or ‘each one’ appears twice in the sentence after each of the nouns, suggesting that each had 4 faces and each had 4 wings. I agree they are the same beasts in Revelation. If find it interesting that Ezekiel speaks of them moving, but John does not. Regarding your camp arrangement. Judah being in the center is idea, but acutally Judah and the other camp heads are first. Judah leads the way and Issachar and next to Judah, then Zebulun. That is the arrangement all the way around the Tabernacle. The flags of the Camp leads should be in front and not centered. I was in the Military for 24 years and the guidon always lead the way and was not in the center. That was how I viewed the movement of the camp until a study with Rabbi Matthew Salathe suggested otherwise. 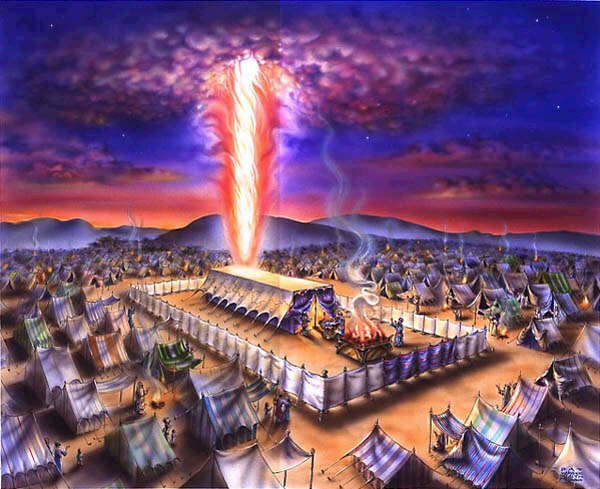 So whether or not God meant it to be literal or figurative, Ezekiel’s vision of the throne speaks to the camp of Israel in the wilderness. And again, the difference I see between John’s vision and Ezekiel’s is that one is stationary emphasizing all those around giving glory to the Creator and ‘Lord of Heaven’s Armies’ while in the other, travel is emphasized. I love this article! I find where Judah is a Lion’s whelp, but I cannot find the other images for the banners that are in the picture. Help me. 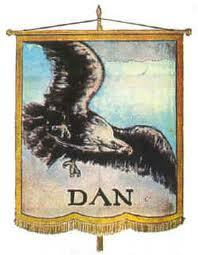 In Genesis 49, Dan is a serpent. Ruben is water and Ephraim is not mentioned. I believe the bull ensign comes from Deuteronomy 33:17 for Ephraim, and there are several references to Reuben being the first born, which would be the figure of a man.